The final of the Association of English Singers and Speakers Catherine Lambert Junior Recital Prize was held at Lincoln Minster School on Sunday 20th November. The judges for the final were Marian Lines and Graham Trew. The winner of the first prize of £300 plus the new, anonymously donated, Speech Prize of £200 was Elizabeth Thomas, a student of Veronica Veysey Campbell at the Junior RCM. 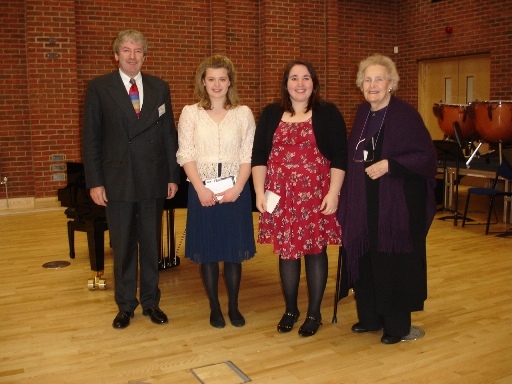 The second prize was awarded to Kirsten Lloyd-Leach from the Birmingham Junior Conservatoire, a student of Coral Gould. Third prize of £100, sponsored by Coral Gould, went to Leila Hills, from the Purcell School, a student of Tom Marandola. All competitors in both rounds have received detailed feedback from the judges. The AESS is grateful to the staff at Lincoln Minster School for their help and for offering to hold the final there. The organisational skills of our own co-ordinator, Carolyn Richards , were tested quite severely this year but she was never phased and is to be thanked for her unstinting efforts for our cause. Thanks are due to Marian Lines for her work in the Final and in the Preliminary Round where she was joined by Judy Hildesley and Betty Roe. Thanks to them also. Graham Trew and Marian Lines with First and Second Prizewinners, Elizabeth Thomas and Kirsten Lloyd-Leach. This entry was posted in Past Events on November 20, 2011 by AESS.